Cycles, Stillness & Flow is my weekly yoga class, offered at YogaSource. Beginning in May, the class time will be Tuesdays, 5:15-7pm. This workshop will focus on the beautiful MogaDao women’s form, Butterfly, with guidance, powerful imagery, and the richness of practicing in a sacred women’s circle. I will be guest teaching Prana Flow Yoga at YogaSource Saturday, Jan 26, 9-10:15am. Join us in a circle of women where we will connect with our native feminine power through journeying, qigong, song, ceremony and learning. Limited to 12 participants. As part of Breath of My Heart Birth Center's free Monday drop-in clinic, I offer BCST sessions by donation. Aleta Braun will also be offering reflexology and jin shin jyutsu sessions. Mothers, babies, little ones, fathers, and family from the Upper Rio Grande region are welcome. I will be guest teaching Prana Flow Yoga at YogaSource on Tuesdays, 12:15-1:30pm for 10 weeks from Jan 8-March 12, 2019. I will be guest teaching Prana Flow Yoga at YogaSource Saturday, Jan 5, 9-10:15am. The Power of the Yin is mysterious, unpredictable, diffuse and unaccountable to time. It is the source of birth and the return to death; the dark night of the soul and the fertile ground from which new life and creativity emerges. As Women we are naturally endowed with the qualities of the Yin. This is our gift to bring to the world, and the resource for knowing our essential selves. When we practice together, we sanctify the Yin, and support each other in our journeys into the mysterious, internal, dark potency of the feminine, braving its liminal depths together. Our practice, led by Daven, will focus on the quintessential women’s MogaDao qigong form: Butterfly, or the Thousand Waters. There will be simple qigong warm up forms as well as some instruction. We will be accompanied by Heidi Svboda, Master Sound Healer, on bowls, gongs, and other sacred instruments. The practice will culminate in a sound ritual led by Heidi. Heidi Svboda has been practicing healing arts for 20 years. She is a massage therapist, as well as an internationally certified sound healer and gong master. Heidi has a strong connection to sacred places and the natural environment. 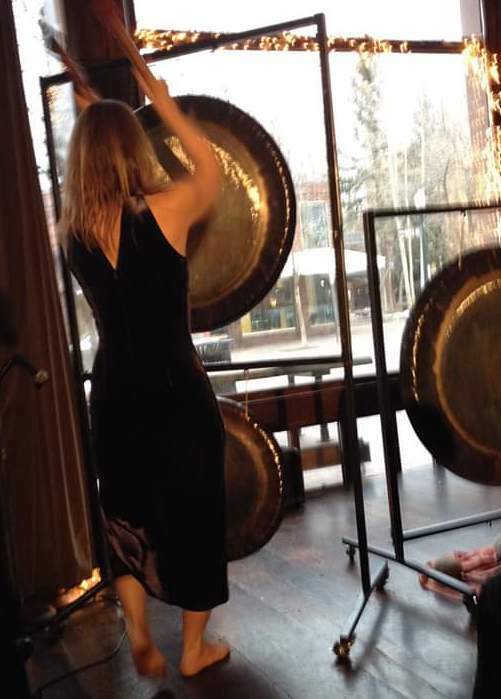 When she plays the gongs all of the sacred energy of all the sacred sights and all of the elements move through her and each sound is medicine. I will be guest teaching All Levels Alignment + Vinyasa Yoga at YogaSource this Sunday Dec 16, 8-9:30am. I will be guest teaching Prana Flow Yoga at YogaSource Saturday, Dec 1, 9-10am. Biodynamic Craniosacral Therapy Sessions by Donation--cancelled due to weather! Due to this lovely snow, I won’t be in Espanola this morning. A Metal Element yoga and qigong practice. As part of Breath of My Heart Birth Center's free Monday drop-in clinic, I offer BCST sessions by donation. Mothers, babies, little ones, fathers, and family from the Upper Rio Grande region are welcome. I will be guest teaching Prana Flow Yoga at YogaSource this Saturday, 9-10am. Summer is the Yang season of the year, the height of expression and manifestation, full blooming in radiance and action. In order to meet this energy, we need to be full in our Yin power so that both energies are harmonized and healthy. In this two-hour women's practice we will come together in a sacred circle to practice with special emphasis on the female MogaDao qigong forms, Internal Alchemy meditation, and other ritual forms that nourish our energy and allow us to open fully to the season. This teaching is offered in the context of Sacred Daoist Sexuality, so that we may come into embodiment as our whole selves. Sexual energy, known as Jing in Chinese Medicine, is our sacred birthright energy; our native, procreative qi. It is this energy which guides us on our unique path in this life--our destiny--and is the source of our health, vibrancy and vitality. To cultivate this energy is not only to become a better lover, but to become integrous and whole, and to express the fullness of our being. In MogaDao Sacred Daoist Sexuality, there are qigong forms and energy practices that specifically cultivate and refine sexual energy. In this class, we will practice these forms with particular emphasis on the men's forms and considerations unique to male sexuality. Some of the forms will be be taught in detail so that students can begin to embody them, take them home and integrate them into their personal practice. This class is being offered as a companion and follow-up to the men's workshop given in June, and is also appropriate for new practitioners. Learn about the complexities of a woman's anatomy and arousal, practice qigong forms to build sexual energy, become the best lover you can be.